Can you believe 2012 is in the history books already? It FLEW by for me. One of my many resolutions for my lucky 2013 is to spend more time creating than I got to spend in 2012. That means a few things have to change - I have to say no a little more often - that's harder than it sounds - and I have to manage my space so that it's always ready for me to create in. One of the things I've started doing to create space is giving things away. I remember when I first started with Stampin' Up! way back in 2001, I was astonished at how much stuff more senior demonstrators just gave away! They'd bring TONS of stuff to meetings and swaps and just gift it to people. Since I was still in massive acquisition mode, I couldn't believe it. But 12 years later, I get it. You acquire a lot of things, and not all of them get used. Or you buy two by accident. Or you know someone will love it SO, so much more than you do, that it's just a joy to give it away. That's what today is about. A beautiful, sweet friend, Latisha Yoast, came up with the idea to just... give. We will end the year and start the new one with a gift. So every single blogger on the Seasons Givings Blog Hop is giving something of their own away. Every. Single. One. No sponsors, no one knows what other bloggers are doing - we all are just choosing a gift from our hearts to yours and doing this thing! So grab your favorite Happy New Year beverage and settle in for some beautiful art, and tons of chances to get a gift to make your New Year brighter. For my gift today, I chose this stamp set because every girl should kick off her year with some fabby footwear! Every person who leaves me a comment - and, if you want to - I'd love to see your wishes or plans for 2013 - will have a chance to win this set, plus a fun little mystery accessories package. Be sure when you leave your comment, if you don't have a blogger profile with an email address attached, you need to leave me an email address to contact you with. You must leave your comment by Friday, January 4th to be eligible. So here's my card for today with my favorite stamp from this set - that gorgeous rain boot. I'm incapable of doing this boot in anything but Pool Party - it's SO pretty! I made the sun out of a scrap of Polka Dot Parade DSP that I cut with my circle die, cut the circle in half, and then hand cut the rays. I punched a half circle out of the remaining half with the 2.5" circle punch for the center. I stamped the boot in Basic Black on Pool Party and then highlighted the clouds with my white gel pen. The greeting is from Feel Goods from the new Spring Mini - click here if you need one. What a fun idea. I remembering being a new demo and not wanting to give catalogs away. I wish I could go back and give away a thousand! I <3 your blog. Thanks for your humor and beautifully inspiring projects. Lydia, these boots were made for "walking"...or dancing in the rain...or any thing they'd like to do! This is a fun stamp and super cute card!! Thanks for sharing!!! What a fun set of stamps! I'm so glad that you are taking part in this giveaway. I really enjoyed seeing your blog! What bright and cheery card Happy New Year Thanks for the chance !!! Beautiful card! Happy New Year! My LOLcat should have special wings and a halo!!! Thanks for the opportunity! Happy New Year!!! I love that stamp set. Very cute card, too. Happy New year! What a cute card, love the little rain bootie. Like your card with that lovely sentiment. What a great set!! And an awesome card. Thanks for the chance to win. Happy New Year to you and yours! You can reach me by emailing usharon59@ec.rr.com. Thanks for the opportunity to win the awesome prize! Enjoyed your blog & card! Lydia, I love what you did with this boot! Especially since I was feeling a tad melancholy missing my mom this new years. Thanks for the little bit of sunshine. Seriously, I really needed your post today. Happy New Year and a blessed 2013. Fun fun card and stamp set you are giving away! My crafty goal for 2013 is to learn all I can to improve my cardmaking and scrapbooking! Love that cheery card with the boot! Thanks for the chance to enter! HAPPY NEW YEAR and thanks for the chance to win. What a cute card! I love your sun/rays. Cute stamp sets too. Who wouldn't love shoes? Just sayin'... Thank you for the chance to win and Happy New Year!!! Love the fun shoe stamps. Your card is so bright, cheerful and fun! Happy New Year! Happy New Year. Love your card. It is so cheery. Thanks for the chance to win a fun prize. What a great card! I love that happy sun behind the rain boots! Perfect! Wishing you a very Happy New Year...I hope to enter more challenges in 2013. Great prize package. Happy New Year! Great card! Love the giving idea - and your package is awesome! Love the rain boot and the chance to win. I want to spend more time outside this year. Thanks for the chance to win. Happy New Year!!!! Love your card and also your blog post! My small craft room is bursting at the seams and I am also looking for ways to purge and organize my supplies better so I can enjoy my crafting time more! I would definitely kick up my heels if I won this! Thanks for the chance and HAPPY NEW YEAR! Love your card...cool boots, and love the sunshine...very cleaver!! Have a wonderful new year of creating!! Such a cute card. Thanks for the chance to win. Happy New year. I know exactly what you mean about gifting. Wishing you more time to stamp in 2013! Thanks for sharing. Happy New Year! I hope to be able to finish a lot of projects I started in 2012! what a fun set of stamps and fun boot card. I wish health and happiness all through the year. Happy New Year. My prayer for you is that every day of 2013 is filled with Peace, Love & Joy......and LOTS of stamping!!! Love the adorable rain boots & love the sunshine! If I win this stamp set the first thing I will do is CASE this card!!! Happy New Year. What a terrific giveaway. Your card is so cute. Great give away! One day at a time, may you and yours have everything you need for a blessed and happy New Year! What a great way to kick in the New Year! Great Card!! What a great blog hop. Thanks so much. Happy New Year! Your card is so bright and cheery and is making me smile this morning. 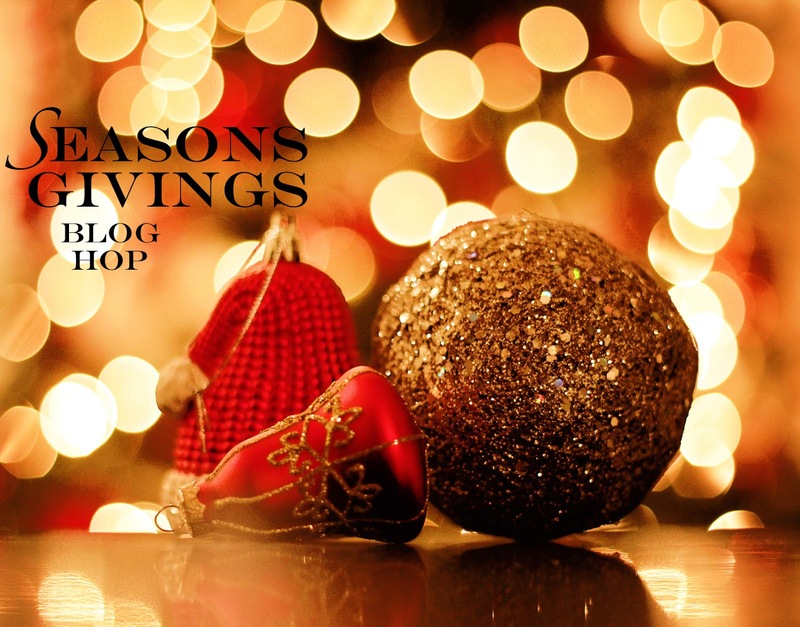 Thanks for being a part of this blog hop. Everyone is being so generous and there will be lots of people being blessed with the giveaways. I need to make keeping my craft area cleaned up so that it's easier to work when I have a few minutes. Happy new year. Beautiful card. I would love this set! What a great idea! I have been gifting some things to my daughter who just recently discovered cardmaking (I thought maybe craftiness had skipped a generation!) and it has been so fun to see her face just light up at getting a package of dimensionals and a punch. Hi Lydia! Happy New Year!! Thanks for the chance to win! Thanks for all the inspiration you give us too. Your blog is my favorite!! I love your card! Tthanks for the chance to win! 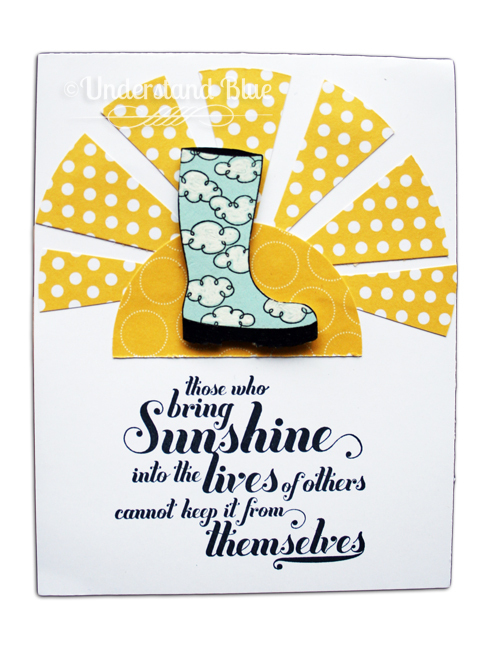 I like the sun on your cute rain boot card. I would like to enter more challenges this year. What a fabulous idea! I could give away something every day of this new year and still not have my craft room cleaned out!! LOL. Thanks for the chance to win! Happy New Year! Awesome card! What a fun idea. Happy New Year! My intentions (since I don't do resolutions) are to clean and organize my studio and create more. your card is so cute. Have a wonderful new year. What a happy and adorable card! LOVE it!!! My plans for 2013 are pretty simple - to take more time enjoying the little things!!! Happy New Year to you!!! That is a great stamp set. Thanks for participating in the blog hop. 2013 my year to step outside of my crafting comfort & try something new ! I am with you on that rainboot. LOVE it! Your card is so pretty. My wish for 2013 is to finish my last semester of school while maintaining my 4.0 GPA. I know it may sound silly, but I do not want to lose it at this point. Thank you so much for your generosity. Happy New Year!! Lydia! What a fun hop!!! I have had so much fun hopping and seeing some of the designers I follow through the year!!! I like to keep my plans pretty simple when the year begins....I tend to make my "new year" resolutions in August when my kids start school....but the word I thought of for 2013 is GROW. I really want to GROW in the art of paper crafting, GROW in loving my family and people I come into contact with ....GROW in keeping my house under control.....Just GROW!!! Love your choice of giveaway!!! Super fun card and a motto I would like to live by!!! Happy New Year to you! This is such a great card and such a fun stamp set. I would love the chance to win! I love this stamp set and the beautiful card you created with it! Happy 2013! So Fun, Happy New Year! Great card, great prize and a great hop!Happy New Year! I am loving this Blog Hop. Love your card. Hapy New Year! My plans for the new year are not to feel guilty about taking time for my crafting! Great prize! My goal is to make more cards (I donate them) and to try some new techniques. Your card is so happy. Made me smile. Thanks for the chance to win. Such a cute card and I've almost purchased that stamp set a couple of times so it would be so cool to win it! Thanks for the chance to win and Happy New Year! What a cute card....love the rubber boots! My wishes for 2013 is for my daughter-in-law to be able to carry and deliver a healthy baby, the last pregnancy ended in a miscarraige. I wanted this set so bad, but I didn't order it. Thanks for the chance to get it. The boots are all sooooo cute! So cute!! That rubber boot is adorable! Thanks for sharing today! Happy New Year. Happy New Year! Your card is so happy! Thanks for the giveaway! Happy New Year! I must tell you that your blog posts are often the highlight of my day. Thanks for sharing your passion in such a humorous way. I love this card. Happy New Year. Thanks a lott for the chnce to win awesome giveaway.. Awesome card, Lydia! Love that sentiment! What a great idea for a blog hop. What a cute stamp set! Love your card too! Lovely set, fantastic project! Happy new 2013! First - Happy New Year! My New Year's goal was to spend less time looking at what I can do and more time doing what I can and I'm afraid I've just spent over an hour failing at that already! Well, it was worth it. Thanks for sharing your creativity - you are an inspiration to many. those wellies are my fave pair in the set! I'm trying to give away absolutely anything and everything I don't use in my craft room. started doing it in November and it feels so good! want to keep it up until I have completely streamlined my craft stuff. also want to make sure to give away or send EVERY card I make. Love your sunshine-y card!! Makes me happy~! Happy New Year to you and many good things for you in 2013~! Plans for the 2013- I plan on making more time for me!!! Adorable card ! Thanks for the chance to win. 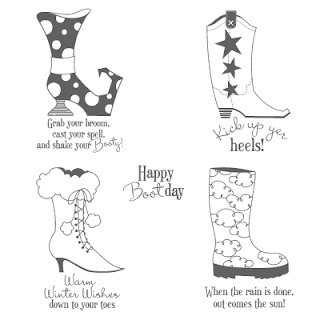 Fantastic rain boots card, love it! Takes me right back to my childhood, dancing in the rain and splashing through puddles! :) Happy New Year! Thanks for the chance to win such a fun treat! Happy new year to you! Happy 2013! I kn ow what you mean about accumulating too much stuff!! I'm enjoying the blog hop and your card's great! I'd love to give your "booty" a new home; thanx for both the inspiration and blog candy opp! What a beautiful card. Love the featured boot. Looking forward to Spring related crafting, especially for Easter. Thank you for a chance to win your generous giveaway. Happy New Year! Happy new year, Lydia!! Love your card!!!! Thanks for the chance to win! Wow, this is so much fun, after somedays without crafting. Thanks for the chance to win some candy! I love your work!! :) Happy New Year! Thanks for the chance!! What a cute set! I plan to craft more in 2013!! Happy New Year! Happy New Year! What a fun way to start the new year. Love, Love, Love the boots. My granddaughters each got boots for Christmas. Thanks for the opportunity to win. Cute stamps and nice & cheery card! Thanks for the chance and here's to more crafting for 2013! Beautiful card and beautiful boot! I agree that it looks beautiful in Pool Party!! I hope to be more giving in 2013. Especially with the cards I make! Such a fabulous fun card. Thanks for an amazing giveaway. A happy new year to you !! OK...one whole file drawer has nothing but all the SU catties from the time I became addicted in 1997. I've got to purge in 2013...again! Thanks for the chance to win some amazing goodies! Wishing you a blessed new year! What an awesome idea and thanks sooo much for sharing these great stamps here. Your card is just gorgeous, and I see what you mean about this stampset. This hop is sooo much fun. Seeing all the creativity in so inspiring. I'd love more time each day to create and keeping my space clean is at the top of my 2013 to do list!! super cute! I love Pool Party too. I am going to strive to be more active on my craft blog. Happy New Year. My plan for this year is to spend as much time with my kids as i can. Wow! Would love to win this package! Oh my word I love those shoes ... how fun ... I will most certainly be adding new shoes to my stash in 2013 ... and also expanding my creative horizons ... and trying to find ways to incorporate creativity into my not so creative day job to keep my mind challenged and engaged. Hugs to you for 2013. Adorable card and stamp set. Thanks for the chance. Happy New Year!! very cute stamps! thanks for the chance at winning! Going to kick up my heels in 2013! Happy New Year greetings to you. A reel "kickin" gift. Hope you have a Happy New Year! adorable! thanks for the chance to win!!! Great card!!! LOVE the boots!!! Cute, cute card and I love me some boots! Yhanks for the hance! Such a lot of wonderful creations on your blog. Thank you for sharing and I would like to wish you a very happy new year. Such a cute card! Love the boot! Great card! Thanks! Happy New Year!! This hop is a lot of fun and a great way to see new artist's (to me) work. Thank you and happy new year! This is such a cute stamp set. Having fun with the blog hop. Thanks! FUN Stamp set!! Love it! Happy New Year! My hope in 2013 is to stay organized so that I can be more productive. I also would like to work on more techniques. Love the giveaway stamp set, especially the sentiments that go with it. I would wish in 2013 that I can practice and become better when using copics. Thanks for the chance to win. Happy New Year. Would love a chance to win some goodies. My wish for 2013 would be for more stamping/ scrapbooking time!!! 'Cause it makes me hap-hap-happy! And...I totally love your bright card. Who wouldn't want to get this in the mail!?! Thanks for the chance. I would love a chance to win some stampy goodness! Thanks for the great giveaway and sharing your cards! Happy New Year! Thank you for the chance to win such a great prize. LOVE your card!! Those boots/shoes could be used so for so many different types of cards! If I'm lucky enough to win the first card will be with the rain boot for my 21 yr old DD! Thank you so much for your generosity and inspiration. I'm going to subscribe....need to see more of your work! Happy New Year! Happy New Year! Great prize pack!Such a cute card! Love that boot stamp set! Fabulous blog hop! Thanks for your giveaway! Happy New Year! Very cute card! Thanks and happy new year! Awesome stamp set! Footwear is definitely important. My hopes for 2013. No surgery would be a great start. No medical problems. I'd love to make more cards for OWH too. Wishing you a Happy New Year! For 2013 I would like to live rather than exist! I think its about time! Thanks for sharing your wonderful, sunshiney card today. Thanks also for your giveaway. That's one cute stamp set! What a fun card! Love it! Happy New Year!! I certainly understand your comment about being "in acquisition" mode. Your journey covers about the same time frame as mine. I'm always open to something new...to me, anyway 'cause I know there is something in my stash to give away. Happy 2013. Love the boots, TFS. Thanks for the chance to win. Happy and safe New Year. Fantastic card! I love the boot stamps and saying- so cute. This year I plan to focus on gratitude and what I am grateful for to look at the positives in life. I just love your card, so cute, thank you for sharing it and the chance to win your great prize. I love boots...all kinds! Thank you for the opportunity to win this super fun set of stamps! Love the footwear stamps. Sure wish they had those cloud boots in my size! My goals for 2013 are similar to what you are doing today. To organize and donate any duplicates or items I don't think I will ever use to a local charity. Then it is to get to work using what I have. Happy New Year. Awesome card, and awesome gift. You have got the right idea, we all need to give much of our stuff away. One of my plans for the new year is to clean out my stamp room and send a goodie box to my niece, who loves to make cards but has limited resources. Can't wait to do this, thanks for the inspiration!! Love your boot card with its spring-like appearance in the middle of our snowy winter (at the moment). I'm so ready for warm weather again! Thanks for your part in this blog hop. It's been such fun. I adore your card! Thanks for the chance to win your fab giveaway. Happy New Year! Love those boots! Thanks for the chance to win! Happy New Year! Oh, my goodness! I adore that little rainboot! My dad just gave me some new rainboots for Christmas and I adore them, too! Thanks for the great giveaway! Great card, Lydia - love the stamp set! Happy New Year! What a wonderful blog hop. Happy New Year!!! This blog hop is very inspirational. Your footwear stamps made of smile. My goals is to unstash my stash and use them all and donate what's left! Love the rain boot on the card! Thank you for being part of the hop , I appreciate the beautiful cards I am seeing along the journey. Awesome giveaway. What a fun prize!! Thanks for participating in the blog hop and for the chance to win!